Rafting is not just a sport but a great outdoor activity for all friends and family to come together and do something fun and healthy. 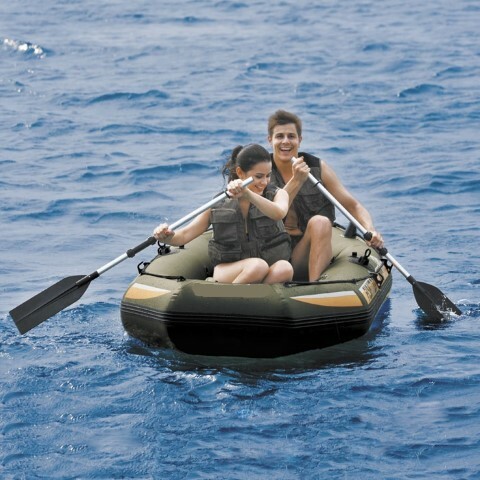 Inflatable raft boats can be used for many purposes, rough rafting in the rivers and seas, exploring the waters or just for a calm fishing outing. It is important that before taking the raft boat out in waters you should practice how to use the boat in safe environment, always wear high safety life jacket and life saving equipment and enjoy the activity near to the shores. Never leave children unattended and without professional supervision. Nevertheless, it is of utmost importance that the raft boat you use is of high quality, does not easily get damaged by sharp objects and is not made of cheap and thin material. Our rafts are made with high quality and safety is ensured with multiple air chambers and abrasion resistant material which is built to last long. These rafts are easy to carry on a back pack, they are easy to inflate and deflate. Its great when you are travelling into the wilderness. Feel free to contact us for delivery of these. We usually have stock of these inflatable rafts.